Recently attending an excellent performance of Much Ado About Nothing at the Pop-Up Globe in Melbourne reminded me of my teenage obsession with the Kenneth Branagh adaptation, but on the recent ridiculously hot day which forced much of Melbourne to literally Netflix and chill, I decided finally to watch the Joss Whedon interpretation. Filmed over a couple of weeks in his house, it’s pretty low-key. Black and white, hand-held and set in contemporary times, so little in the way of costumes and finery. And really fun. It was interesting to see how differently lines can be interpreted, lines which were played for laughs on the stage and played with earnestness in the Branagh version were, in this, more serious, or more ‘natural’, or more cutting. The performances were fast talking – like an Aaron Sorkin script – but conveyed the meaning of the dialogue and the overall theme. The cast was great, though for me the real standouts were Benedick (Alexis Denisof) Beatrice (Amy Acker) and Dogberry (Nathan Fillion), though they are all the most fun and funny roles in the play, so it may also be somewhat my own bias. What do you do when there is a writer’s strike on and no television is being made in Hollywood, but you are Joss Whedon and you want to be creative? Make a three-part musical to put online. Get some typically Whedon awesome scripting, set it to fab music, get a tight as crew and get a group of awesome actors including Neal Patrick Harris and Nathan Fillion to put it all together in no time. The plot? Dr Horrible (Neal Patrick Harris) is a super villain who is desperate to join the Evil League of Evil and is making all kinds of evil plans to get in. Meantime, he has a crush on Penny (Felicia Day), a girl he sees regularly at the laundrette. But all of his plans are laid to waste when his nemesis Captain Hammer (Nathan Fillion) not only thwarts his evil plans, but starts dating Penny. Dr Horrible needs to pull out all the stops to make sure that he wins. So fabulous. Just wonderful story telling that takes you places that you don’t expect and leaves you… nope, can’t even think about the end. Go watch it. So how did Sully (John Goodman) and Mike (Billy Crystal) become such a successful team? 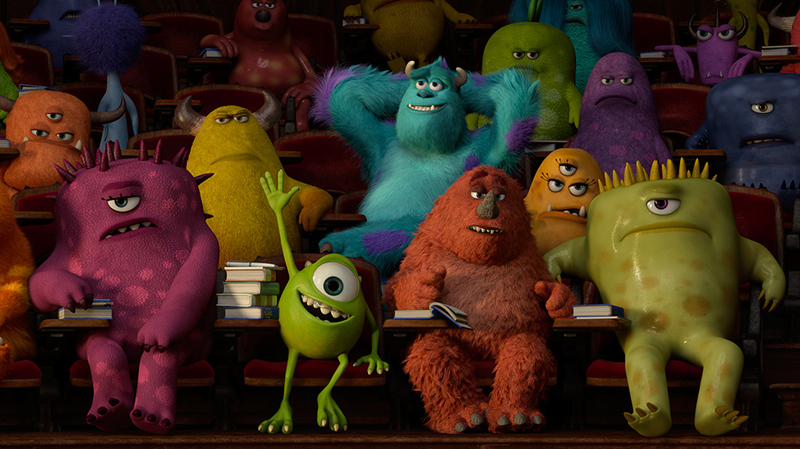 This takes some of our favourite characters from Monsters Inc back to their past at university – with Sully as an arrogant jock, Mike a mega-swot desperate to become a scarer and Randy (Steve Buscemi), the future bad guy, as a geek and a nice guy. I liked it. It was fun, the characters were as strong as in the earlier film, and it had the great sense of humour of so many of the Pixar flicks. It is a tricky task – to take characters that people love and put them in a different scenario. Especially as, for some parts of the film, the audience really doesn’t like Sully. I’ve heard many criticise that it was too similar to Monsters Inc and I reckon that is a stupid argument. Remember, this is still a film aimed at kids; if you expect something totally different, watch something totally different. Grumble over. Firefly was the television series that Joss Wheedon made around the time of the success of Buffy and Angel. It was cancelled after a season, much to the despair of the cult following it gained. However, in 2005, this film, Serenity, was made, and it is one hell of a way to bring some closure for the fans (yet with still a hint that a sequel film and/or series could be created). It’s a science fiction; because Earth could not sustain the large numbers of humans, many ships were sent to a far part of the universe where many planets were terraformed to become habitable, and then settled. There has also been an inter-galactic war. Mal(Nathan Fillion), the captain of Serenity, was a fighter on the losing side of the war. He, with his small crew, travel from planet to planet as guns for hire, performing robberies and the like for money. However, they have taken on a couple of guests, Simon Tam (Sean Maher) who is a doctor who patches the various injuries along the way, and his sister, River (Summer Glau) who is a teenage psychic he has removed from experimentation and is an unknown quantity. Suddenly, everyone is against them and things get most exciting. It took me a couple of goes to get into the television show, and that was several years ago. However, I recall loving it; loving all of the Joss Wheedon humour and characters. The cast is awesome fun, and includes one of my favourite ‘that guy’ actors who keeps popping up – Adam Baldwin (playing Jayne, with a most amusing tough-guy voice). I couldn’t believe it when I realised that I, being so obsessed with watching everything in a series or a group, had missed Serenity. I knew it existed I just, kind of, didn’t watch it. Now it’s been so long, I can’t really compare Serenity to Firefly, but I can say it works as a stand alone film. What’s more, it’s got a whole bunch of fighting, exciting chase scenes, and that wonderful humour. Yup, I loved it.